This is SO not what you think. A ricotta jam jar? It’s not just jam. It’s like a snack in jar. It’s a ricotta jam jar snack! Creamy ricotta. Topped with a light layer of pesto. Topped with a quick tomato jam. The perfect combination of sweet and savory. Eaten with crunchy, salted toasted baguette slices. Yes, that’s what it is. An amazing snack (or heck, the way we’ve been eating it, a meal) in a jar. 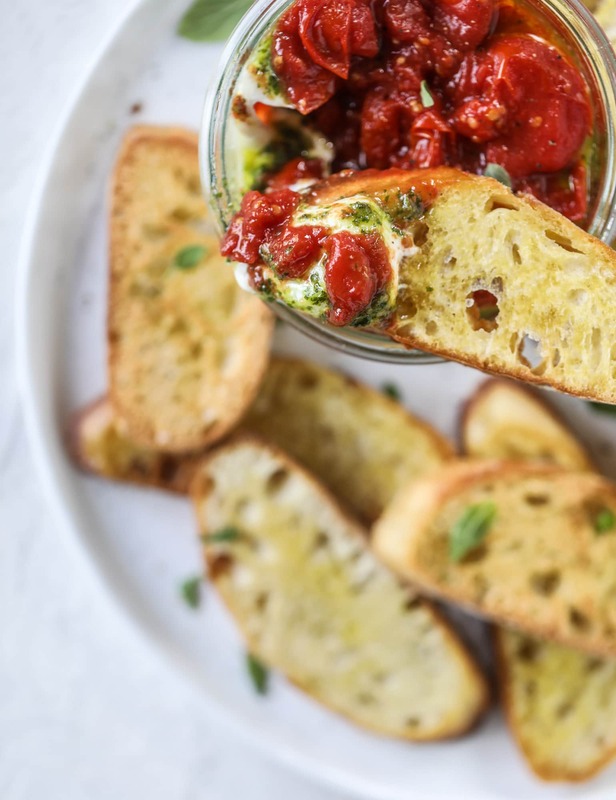 One you can make for an appetizer or take to a party and it’s to die for. Seriously! And yep, this is weird, because I shared salads in a jar on Friday. Completely unintentional and unrelated. But I mean, quite serendipitous if you happen to be buying jars! So here’s something wild. This is also the second recipe in one week that I’m sharing based on an experience at Nordstrom café. HA! Either I need to get out more or… I just keep ordering the right things off of the menu. Why are their meals so good? This very rarely happens, but I had this on Friday afternoon, tested it on Saturday and am sharing it today. I bumped a cider pork chop recipe just FOR THIS. It may very well be in the top ten of snacks I’ve tasted. EVER. This was on the specials page when we ate at Nordstrom Café on Friday afternoon and Lacy was like, we HAVE TO GET IT. It was unreal. And once we started eating it, I soon realized that I had all of the components on my blog, like all of the recipes already written and tested, to throw it together and make a dream come true. Yeah, I’m kind of cheating. This isn’t rocket science here and I basically combined a bunch of recipes I already have to layer together this delicious jar. But you have to try it. Because holy cow. This tastes like heaven. Also. Can you believe it’s the last week of summer? I can and I can’t, which I’m sure you have gathered considering I’ve written that sentence like 14 times in the last two weeks. To celebrate the end of this season, I had to share this fabulous mess TODAY so you can use your garden haul. All the juicy, perfect tomatoes. The piles of basil that you probably had piled up for pesto anyway. And ricotta cheese, whipped and smooth and creamy. Practically soft serve. Oh and bread. Because, duh. Another thing. And don’t slap me when I say this. But this is going to be my holiday appetizer. Oh heck yes, it is. It’s red, green and white! This recipe does double duty. It’s easy. Perfect for the holidays. You can still buy basil for pesto or buy it jarred in the winter. 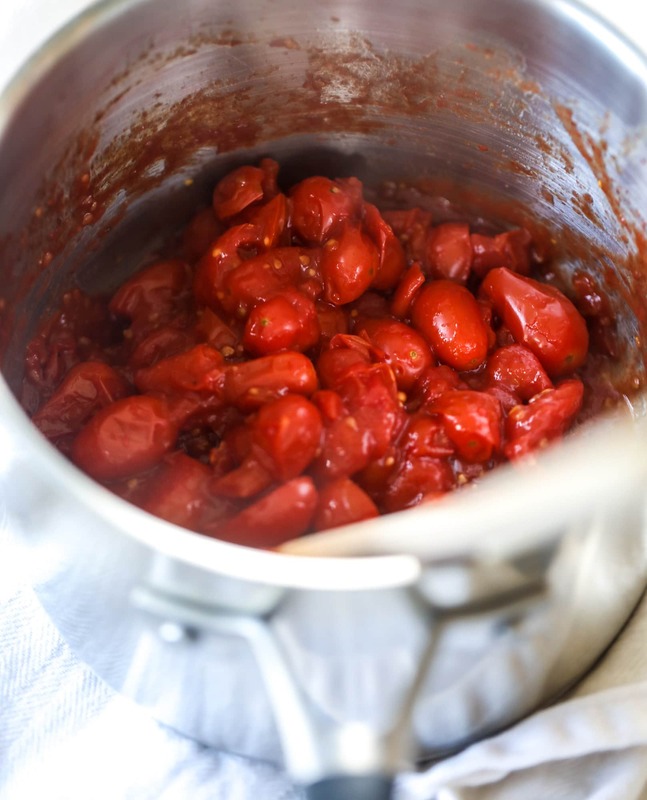 You can make the tomato jam ahead of time. Assemble and serve and appear all fancy because of this app in a jar. However. It’s delicious and perfect for right now, because all of the ingredients are peaking in season and they are ripe and taste their best. THIS is the best way to live up the end of the summer, if I do say so. 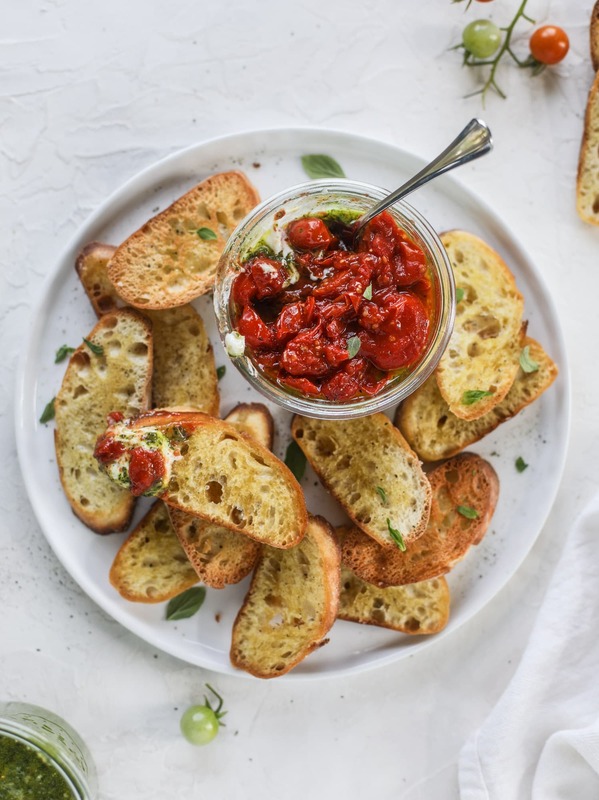 This Ricotta Tomato Jam Jar is inspired by Nordstrom Cafe! 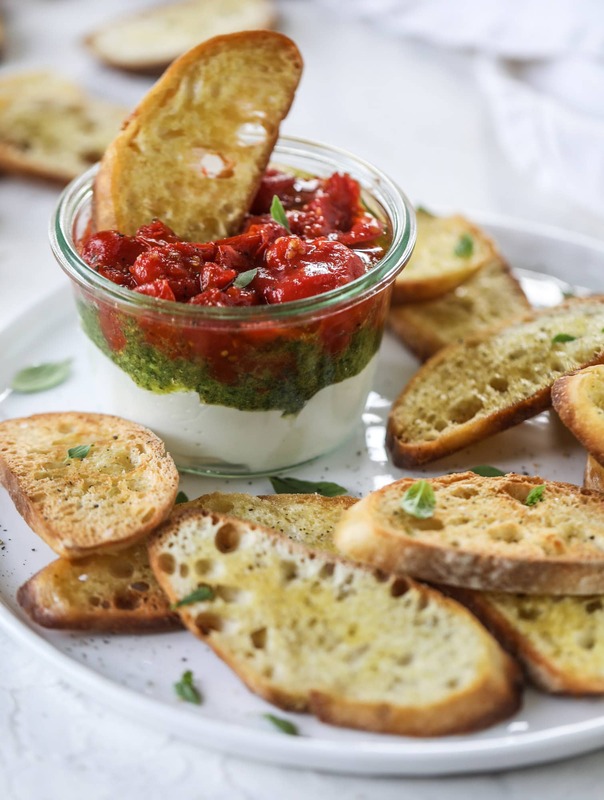 It combines creamy ricotta, a light layer of pesto and topped with a quick tomato jam. The perfect combination of sweet and savory. Eaten with crunchy, salted toasted baguette slices. As a note, of course you can just use store-bought everything! I included all the recipes for my favorites above, but if you only have time to grab store bought ingredients, it still tastes good. Preheat the oven to 400 degrees F. Slice a baguette into thin slices. Place the slices on a baking sheet. Drizzle with the olive oil and sprinkle with the salt and garlic powder. Bake for 10 to 12 minutes, until golden and crunchy. 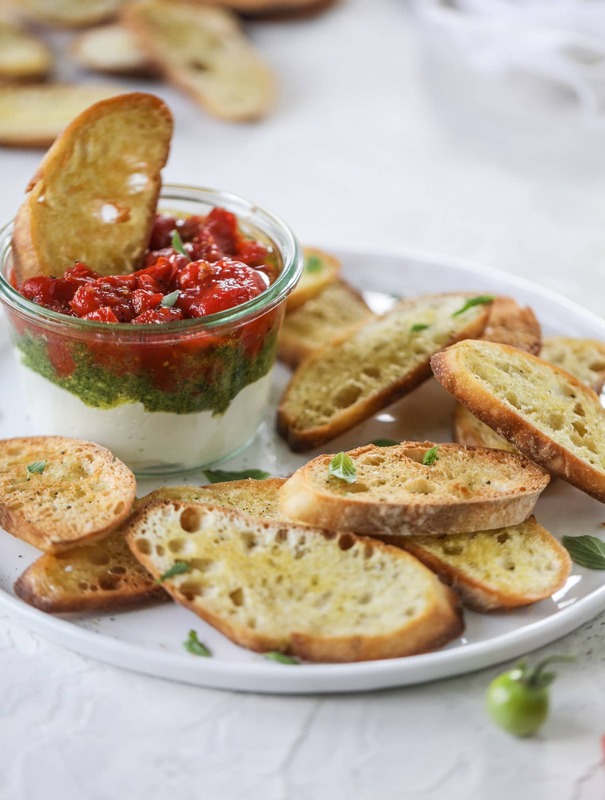 While the baguette is toasting, place the ricotta cheese in a food processor and blend until creamy and smooth. Scoop it into a jar. I like to use these .25 liter weck jars. Add the pesto on top. Add the tomato jam (make sure it is cool) on top of that. Sprinkle with fresh herbs. Serve with the toasts! DEVOUR. If you want the mixture to stay chunk, keep it as it. If you want it smooth, carefully transfer it to a food processor or blender. Blend until pureed. Pour into a jar and let sit at room temperature until the mixture cools completely. It will thicken more as it cools. Once cool, store in a sealed container in the fridge. 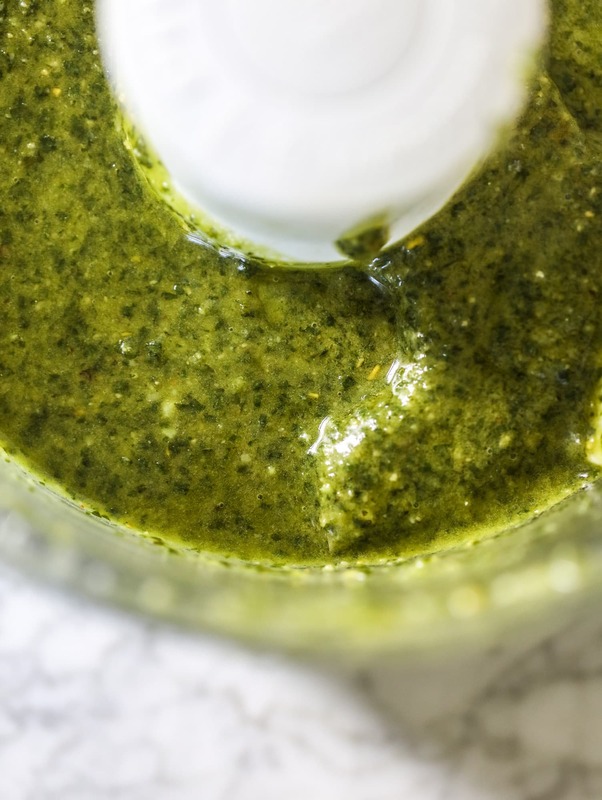 To make the pesto, combine the basil, cheese, pine nuts and garlic in a food processor. Pulse until small crumbs remain, and then with the processor running, stream in the olive oil. Start with the 1/2 cup and add the extra if needed to reach the desired consistency. Add the salt, pepper and pepper flakes and blend again. Taste and season additionally if needed. Seriously, I don’t know what I even did before a ricotta jam jar. On Blogging: Building an Audience. By “holiday appetizer,” you mean “random September Monday,” right? hi! you can def make it all in advance, but i would wait to assemble the layers until right before you leave for a party or like, 30 mins before guests arrive. it actually does look pretty all mixed together too, so if it kind of mixes, it would still be good! Jessica this looks so good!!! I just love anything with ricotta, so you had me right there! I’m also trying to embrace this last week of summer (I made a cherry clafoutis this weekend!) but also SO ready for all the pumpkin and apple things. Can’t wait to try this recipe! Three of my favorite things ever in a jar!! YES! I need it! Thank you. Thank you. 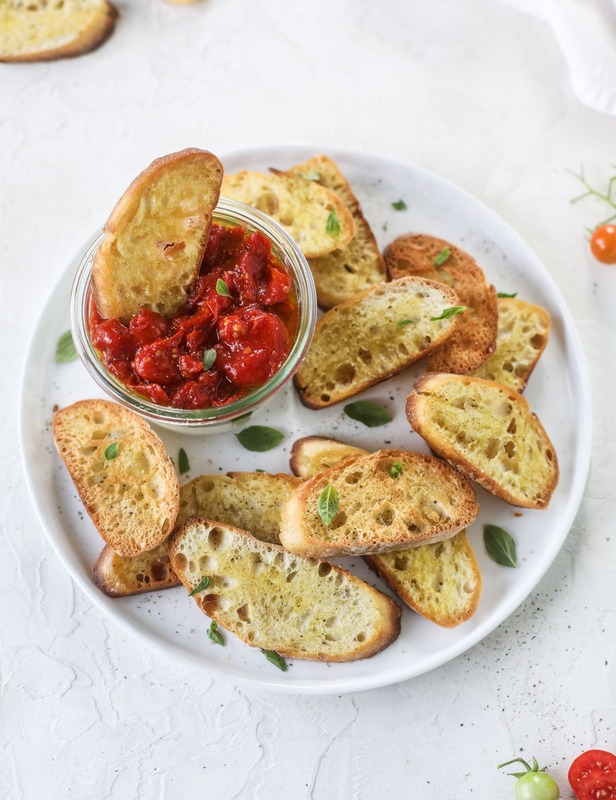 Thank you for this amazing snack or meal recipe! Yes! I’ve totally had this at Nordstrom Cafe and recreated the recipe a few years ago when I was trying to blog! 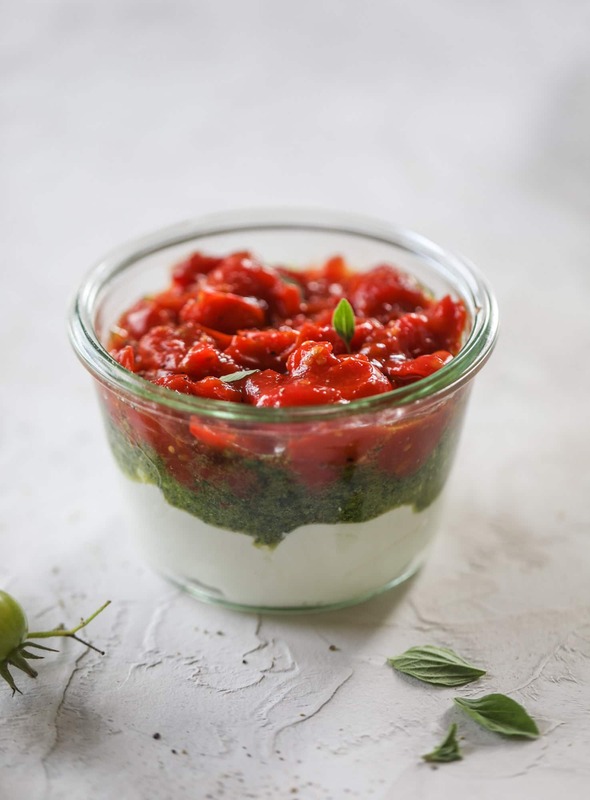 lol http://www.sharingmyjoy.com/2014/12/recipe-ricotta-and-pesto-spread-with.html Sooo yummy! omg that is amazing!!! ahaha i didn’t even realize it had been around, totally thought it was a new thing. i’ve been missing out!! This looks amazing!! I’d love to make this for a holiday appetizer but I don’t know if I’d want to explain it to my family lol. I’ll jusy make it and eat it myself. 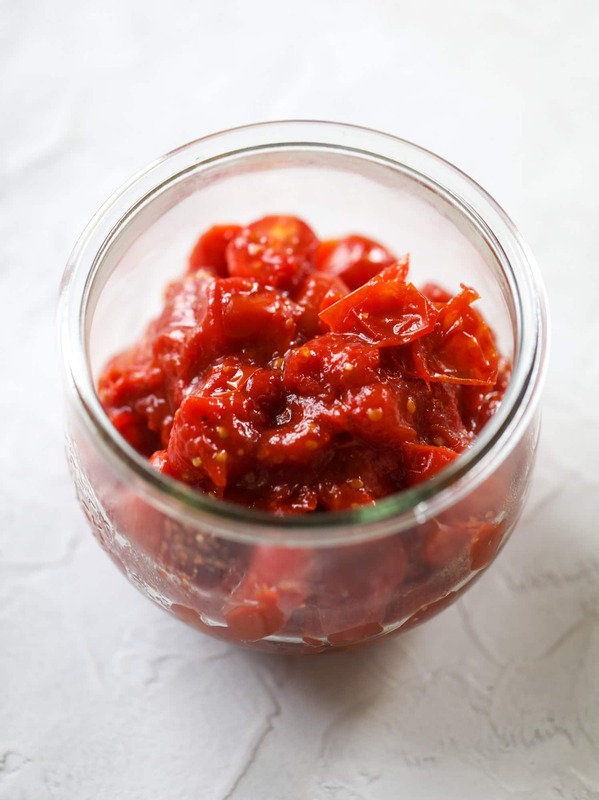 The dish is very attractive, but is it too sour when using tomatoes a lot? Dear Jessica, don’t you find tomatoe skins annoying? Once cooked, I usually tong them out! Crazy, I know. It’s on my list to try for sure! This looks sooo good!! Just unbelievable! I need to try this as soon as I possibly can! Sweet Tomatoes!!! Love this recipe! These beautiful jars of love would be a special decoration you could eat at a catered wedding event as a table side hors d’oeuvres. Great execution! Pingback: This and That - Recipes, Cooking and more! I’m sorry if this is a dumb question, but I have a garden that is exploding with Roma tomatoes. Do you think i could sub those in this? Thanks, in advance! This looks so good!! Why have I never thought of this before? It looks like it could be the best thing ever. So trying it this weekend! You seriously have the best blog for food inspiration! I am going to try this recipe a well! I feel like it would be perfect to serve company! I doubled this and filled little jars for a girlfriend cocktail party. HUGE HIT! I knew I would love these but was so happy my guests did as well. Thank you Jessica, your creativity always amazes me. Plus, you are one of the few food bloggers whose recipes I always trust. Can you tell me what size jar you are using? I just saw the answer to my question, sorry!! Made this last evening for a girls happy hour. I made it in a small flat dish rather than the jar. It was by far the fan favorite. I served with a variety of crackers. Will be making this often. Thanks for the inspiration. Pingback: BROT | Rezept für Scones mit Oliven und getrockneten Tomaten - Fräulein Cupcake: für alle, die Süßes lieben! We are mainly do glass kitchenware,glass spice jar,storage jar,canister,oil and spice set. If you need I will send you more items for your reference. Any other comments pls feel free to let me know. Hurray! I used to get this several years ago at Nordstrom Cafe! I went to buy some this holiday season and it was not offered and no-one even knew what I was talking about! Thanks Jessica!